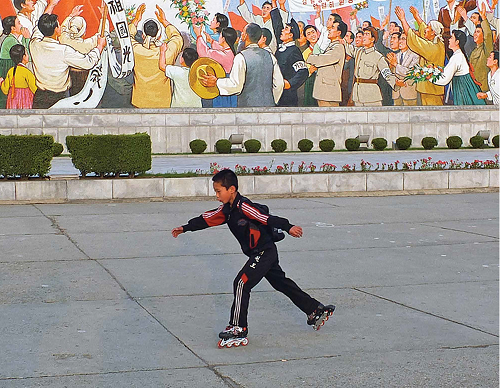 Rollerblading has become a hot new hobby on the boulevards of Pyongyang. Painting a masterpiece and reforming North Korea have a surprising number of things in common. We know the necessary ingredients, tools and available techniques. There are numerous cases for comparison and a large body of literature to study. Still, few if any of us can create art to equal that of old masters such as Rembrandt or Kim Hong-do. In theory, realizing North Korea’s potential seems easy. State socialist systems have been well researched and understood for decades. We possess a growing amount of empirical knowledge about North Korea. We can look at transformations in China, Vietnam and Eastern Europe for guidance. Incentives have to be set right, so that resources are allocated more efficiently. China has demonstrated that this does not require a fully-fledged Western-style democracy, just a stable currency, markets where demand and supply result in realistic prices, private ownership and an economy that can freely import and export goods, services, capital and technologies. Until the death of Kim Jong Il in December 2011, the big question affecting nearly every aspect of North Korean affairs—domestic or international—was who would be his successor. Now that this issue has been resolved by the selection and promotion of Kim Jong Un, the focus has shifted to the nature and sustainability of the new leadership. The four mega-events in April 2012 were supposed to provide insights: a Worker’s Party Conference, a session of the Supreme People’s Assembly, a missile/rocket/satellite launch, and the long-prepared celebrations of Eternal President Kim Il Sung’s centenary birthday. We could indeed observe dramatic changes, particularly in the DPRK’s ideology—a field that Kim Jong Il in 1995 described as the key frontier in the defense of socialism (Korean style). This article is based on my personal observations during a visit to North Korea from April 10-16, 2012, as well as official DPRK material, and addresses the question: Are recent ideological changes just a regular progression in a linear, continuous development, or do they mark a major disruption? It did not take long to notice the first of these seemingly dramatic changes when I arrived at the Sunan Airport in Pyongyang. I am not talking about the new terminal(s) or the masses of foreigners who flooded into the hopelessly overwhelmed country. Rather, it was the badges worn by North Koreans that caught my attention. 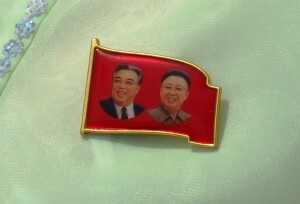 These badges portraying a smiling Kim Il Sung have long been a subject of curiosity and, at times, ridicule by foreigners. Questions about their shape and size (do specific badges indicate importance? ), rules for wearing (do they even put them on their swimsuits? ), and availability (they can’t be bought, they can only be bestowed upon you) have been the subject of many tourist conversations, in particular over beer in the evening. But for someone like me who has been to North Korea frequently since 1991, I hardly notice the badges anymore. Neither do the North Koreans. For decades, the badges have been a part of the system’s iconography, just like the various Kim Il Sung statues in Pyongyang and across the country. April 2012 promises to be an interesting month for North Korea and its observers, with at least four mega-events. The long announced celebrations to mark the 100th birthday of the country’s late founder Kim Il Sung will be held on the April 15. Two days before, the annual session of the Supreme People’s Assembly (the North Korean parliament) will convene. The fourth Conference of the Korean Workers’ Party (KWP) will take place on the 11th. Last, but not least, around the same time a rocket launch that has been criticized by the West as a missile test is set to take place. April 15, 1912 was not only the day the Titanic sank. In a small village near Pyongyang, a boy with the name Kim Song Ju was born. Later, much like Lenin (Uljanow) and Stalin (Tschugaschwili), he adapted an alias. In October 1945, by then called Kim Il Sung, the 33 year old youngster was presented to the wondering population by the Soviets as the liberator of the country from the Japanese. Hardly anybody took the young man seriously back then, neither his Soviet protectors nor his much more numerous, senior, powerful and experienced domestic political competitors. They were wrong, as they later learned the hard way. By building and breaking alliances, first the Christians and then rival factions within the Korean Communist camp were eliminated or assimilated, until Kim Il Sung and his Kapsan guerilla faction had acquired a monopoly of power within the KWP. Kim Jong Il’s death was announced less than three weeks ago. But the world is surprisingly quickly getting used to the new leadership in North Korea, as if there were no concerns left at all. To provide a counterweight to this amazingly complacent mood, and the many speculations about a stable North Korean future (including my own), I’d like to play devil’s advocate and ponder a relatively pessimistic scenario based on my reading of some developments that should be watched carefully. In the wake of Kim Jung Il’s death, and questions hanging over the country’s future direction, Political Tours is organizing a tour to North Korea this April. The visit is being led Professor Rudiger Frank, head of Korean studies at the University of Vienna, and one of the world’s leading experts on North Korea.